Share the post "Album review: H.E.A.T. 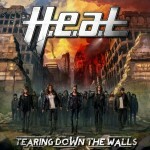 – Tearing Down The Walls"
Album number four by melodic hard rockers H.E.A.T. and the second with vocalist Erik Gronwell, who has really established himself particularly live where he is a livewire front man. The album is not as instant as previous ones, bar the hard rock stomper ‘A Shot At Redemption’ that was released as a single back in February. You have to give it a few spins but then the songs really hit home, none more so than the title track a power ballad complete with strings and a rousing chorus, immense tunage in anyone’s book. ‘Enemy In Me’ would make a good next single with its sing-a-long gang chorus. The keyboards of Jona Tee get plenty of limelight throughout the album none more so than on ‘Mannequin Show’ with a wash of keys throughout the song. Needless to say vocalist Erik Gronwell is on top form, whether he is singing his heart on the ballads like ‘All The Nights’ or belting it out on the rockers like ‘Emergency’. ‘Laughing At Tomorrow’ sees the band go off in a slightly different direction, with a real pop rock chorus the sort of song the Stage Dolls do so well. This entry was posted in ALBUM REVIEWS, ALBUM REVIEWS (Mobile), All Posts and tagged album, Eric Rivers, H.E.A.T., HEAT, interview, melodic rock, review, Sweden, Tearing Down The Walls. Bookmark the permalink.